*NOTE - Spring and summer are extremely busy seasons for wildlife rehabilitators and most run on limited staff, rescources, and volunteers. As they may be busy helping the animals in their care, do not be surprised if you have to leave a message and have someone get back to you. *Before you call, take note of the types of permits they possess. As of Spring 2019, the individuals listed in Sangamon county are licensed for some mammals, but NOT birds or deer, meaning you may have to look farther away for assistance. 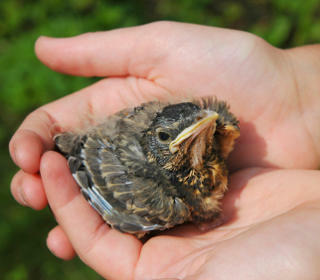 Only people with the proper rehabber permits may have native* wildlife in their possession. If the first link has expired, try the link within this page. Treehouse Wildlife Center - Found an Animal? It's worth noting that there are three species not protected by federal laws: House sparrows, European starlings, and Rock (common) Pigeons are not native to North America and a permit is not needed to help them. We still recommend the above advice of letting the parents raise the babies whenever possible. However, for birds that do need help, not all rehabbers have the time or space to take in non-native species, so we provide the links below to give other options. Pigeon.org - found a lost domestic pigeon (with a leg band)?